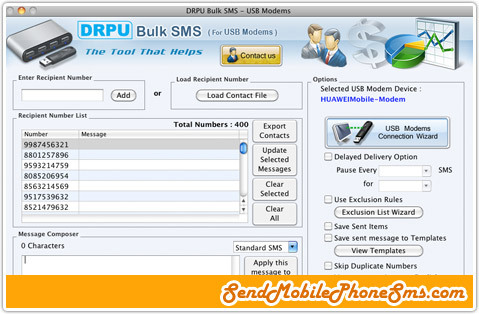 Mac Bulk SMS Software for USB Modems enables you to compose and send multiple numbers of text messages from Apple Mac OS X installed computers using USB Modem. This effective text messaging program is useful to send business campaigns, news alerts, stock market information, greetings, reminders, notifications, share market updates, Product launching details and standard SMS. Mac sms sending program is developed with advanced delay delivery option to control and customized load of bulk SMS broadcasting. Mac SMS sender program for USB modem provides facility to send standard messages or notifications over worldwide location. 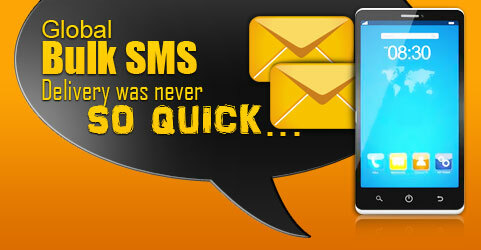 Sends SMS in different languages : Mac bulk SMS sending software for USB modems successfully sends group text messages in different text over global mobile network. Provides Exclusion list wizard option : Mac SMS broadcasting program has inbuilt exclusion list wizard option for maintaining list of contact numbers during text message sending procedure. Delay delivery option : SMS messaging program provides delay delivery option to manage and customized load of bulk SMS broadcasting. No internet connection is required for sending text SMS : Mac SMS broadcasting program delivers group text messages over global mobile network without internet connection. Saves sent text message details : Mac bulk SMS program for USB Modem successfully saves sent text messages details to templates.